Yen Tu relic is located atop Yen Tu Mountain in the Dong Trieu range, Quang Ninh Province. With its sacred pagoda made from bronze at 1,000 m, it is a popular destination for many people in the north. In the past visitors and pilgrims had to walk up, but now they can take a cable car to the Dong Pagoda at the mountain top. Around Yen Tu Mountain are many other things to admire such as Giai Oan and Hoa Yen pagodas, Giai Oan Stream, Truc Lam and Trinh temples, Hue Quang Tower, and the statue of Emperor Tran Nhan Tong. Tran Nhan Tong was the third emperor of the Tran Dynasty, reigning Dai Viet (the name of Vietnam then) from 1278 to 1293. During the second and third Mongol invasions of Dai Viet, the emperor and his father were credited as the supreme commanders who led the Tran Dynasty to the final victories and since established a long period of peace and prosperity over the country. It takes quite long to travel from Hanoi to the foot of Yen Tu Mountain, so you need to start early. A 1 day-1 night trip is recommended. 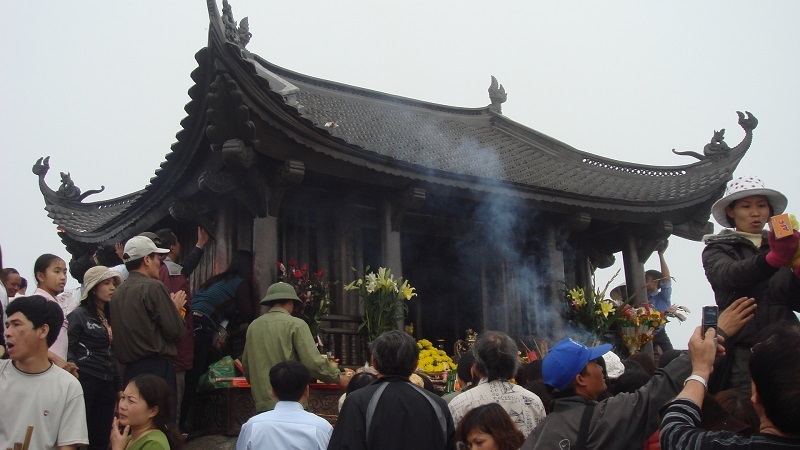 The Huong Pagoda Festival is one of the biggest spring festivals in Vietnam. It goes on for nearly three months from the 6th of the first lunar month. The peak of the festival is from the full moon in January to the 18th of the second lunar month. Tens of thousands of people come here every day, causing huge crowds and pushing the cost of services up. The pagoda and Huong Tich Cave are in Huong Son Commune, My Duc District, near the Day River, 65 km from Hanoi's center. The road to Huong Pagoda is a charming sight with green mountains and a blue river. Tourists sit on boats and go along the dreamlike Yen Stream to the final destination, Huong Tich Pagoda. Along with Huong and Yen Tu pagodas, Bai Dinh Pagoda is one of the three most famous spiritual places in northern Vietnam. The pagoda in Ninh Binh Province has been renovated and upgraded on the foundation of an ancient pagoda. The Bai Dinh pagoda complex has an area of 1,700 ha including the old and new pagoda areas and others such as a cultural park, Buddhist academy, and Dam Thi lake. It has Asia's largest gold-plated bronze Buddha statue and the longest Arhat corridor. 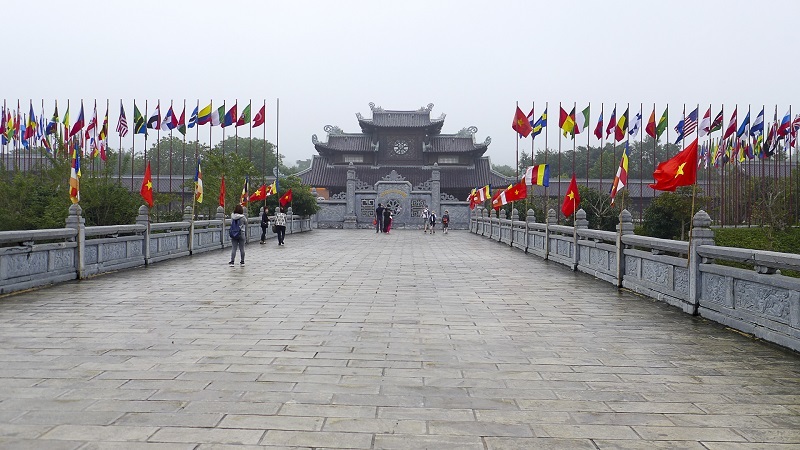 Bai Dinh is very close to other attractions in Ninh Binh such as Trang An, Hoa Lu, Tam Coc, and Bich Dong. This land is also famous for its delicious cuisine. A complex of temples in Loc Vuong Ward, Nam Dinh, close to Highway 10, the Tran Temple was the place to worship for the Tran emperors and mandarins serving them. The temple was built in 1695 on the foundation of an old temple of the Tran Dynasty (1225-1400), which had been destroyed by the Ming (China) invasion forces in the 15th century. It has three main buildings, the Thien Truong Temple (Up Temple), Co Trach Temple (Down Temple) and Trung Hoa Temple. To enter it, visitors have to pass through the citadel gate. The Tran Temple Festival on January 15 of the lunar calendar (February 19 on the Gregorian calendar this year),which celebrates the Tran Dynasty and its famous resistance against three Mongol invasions, is a chance for people to pray for good fortune in their lives, and especially in business. The festival also features activities like wrestling, dragon dance, lion dance, cockfighting, bottle throwing, swinging, playing chess. If you have the opportunity to come to Vietnam in the spring, don't miss these famous spiritual destinations. There are many interesting cultural experiences for you.